The Sayl office chair, with its mesh back, Y-shaped support beam, and otherwise nontraditional looks, would fit right in an office space from a high-design, dystopian future. How do we know? 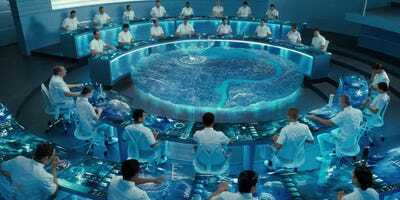 It made more than one appearance the “Hunger Games” franchise. The game makers who control the Hunger Games sit in a control room furnished with white and steel Sayl chairs. Created by legendary industrial designer Yves Béhar, the Sayl chair has become one of the hottest seats in Silicon Valley. The $499 chair juggles ergonomic design and aesthetics, making it a desirable piece of office furniture for those who spend their 9-to-5 behind a computer. The chair draws inspiration from the city of its birth, San Francisco. When Béhar, founder of industrial design firm Fuseproject, set out to create an affordable, high-design office chair, he wanted to use as few materials as possible to cut costs and waste. He looked to the Golden Gate Bridge, an architectural marvel that delivers strength and durability despite using less material than other bridge types. 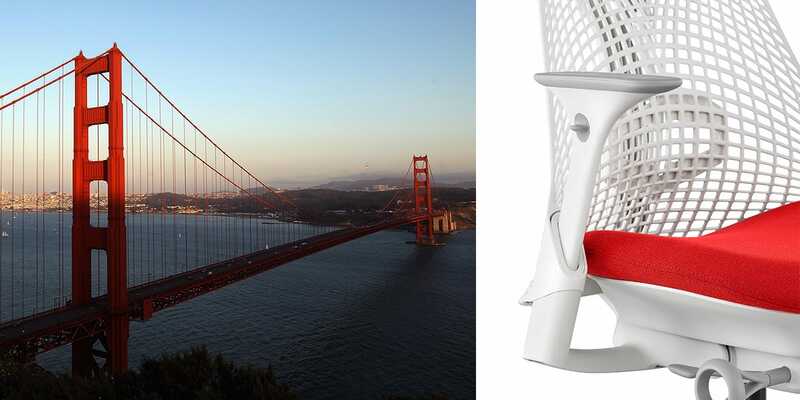 Ezra Shaw/Getty Images; Herman Miller; Melia Robinson/Business InsiderThe Sayl Chair gives a nod to the Golden Gate Bridge. The “less is more” principle is a cornerstone of suspension bridge engineering. The deck (where cars drive) hangs below suspension cables connected between towers. The historical truss bridge, by comparison, bears weight on a triangular lattice made up of rigid beams. Béhar applied the concept behind the Golden Gate Bridge to the desk chair. The Sayl uses a single sheet of urethane, a type of plastic known for its elasticity and high load-bearing capacity, for the back. 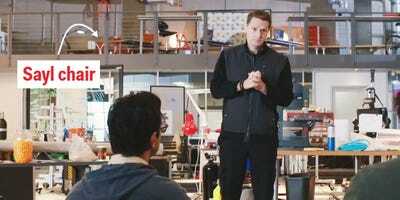 It has no hard edges, Fast Company’s Cliff Kuang reports. “The urethane sheet itself has varying densities all along its length — so that you get a softer feel around the shoulders and edges, but stiffer support around the spine,” Kuang writes. The design strikes a healthy balance between support and freedom to stretch in all directions. The Sayl went through 70 iterations before landing on its final look. You can buy it in black or white on Amazon or customise your own on Herman Miller’s online store. It’s also the chair of choice at Béhar’s debut coworking space, Canopy, located in San Francisco’s Pacific Heights. Paying $500 for a chair like this may seem like a lot. Most ergonomic office chairs sold at Staples come in under $200, though review site Wirecutter picked a $895 chair from Steelcase as its best office chair pick in 2015. 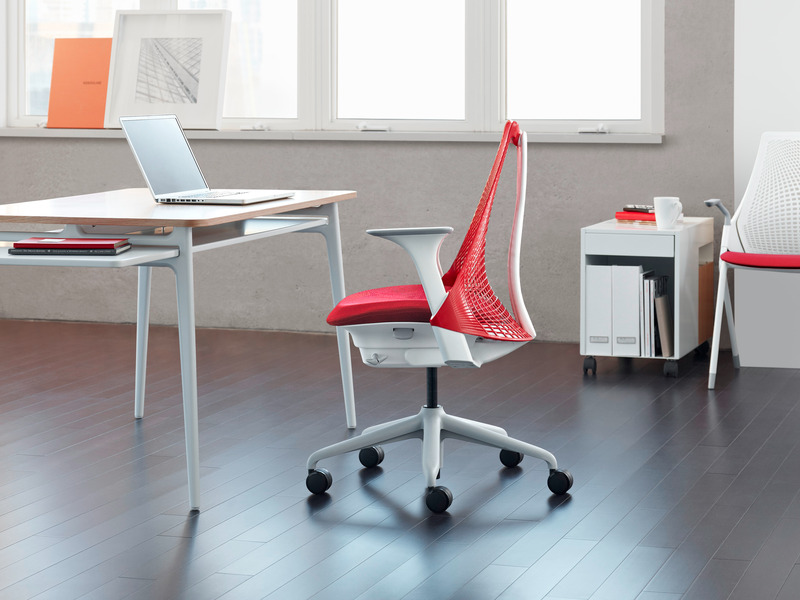 Two days in my Custom @HermanMiller Sayl chair, and my back is thanking me. Beautiful, comfortable, and supportive.